Annual bedding and garden plant sales represent approximately 70 percent of the total U.S. bedding and garden category, according to the USDA National Agriculture Statistics Services, totaling $1.29 billion out of $1.86 billion wholesale. Annuals pick up where perennials leave off, providing colorful foliage and flower displays inside the season. Customers are continuously searching for something to perk up their dark corners, their doorways, their hanging baskets or borders. With that in mind, we shine a spotlight on annuals that not only do all that, but are reliable and prolific growers that customers can depend on. Celosia argentea ‘Intenz™ Classic’ has an unusual and unique color pattern on the foliage, so even before its prodigious early blooming, the plant is interesting, said Monica Fossi of Yoshitomi Bros. Inc. (West Linn, Oregon). It attracts bees, is heat tolerant and low maintenance, and can be used in the ground or containers. Kyle Peterson of Pacific Crest Nursery (Woodburn, Oregon) said Celosia ‘Dragon’s Breath’ is a rare offering, with its dark foliage and almost neon, long-lasting 24-inch plumes that makes a great summer shoulder plant at garden centers. “It really has a different look, and any time you change the foliage color, it usually does a good job of drawing interest from the consumer,” said Peterson. Plus, it’s easy to grow, sun-loving and long-lasting. Photo courtesy of Terra Nova Nurseries Inc. The characteristics of the prodigious bloomer Coreopsis ‘Cherry Pie’ warranted its introduction, said Dan Heims of Terra Nova Nurseries Inc. (Canby, Oregon). The deep red daisies with overlapping petals sit atop a rounded cushion that defies the reputation of past coreopsis, which showed at times mounds of browning flowers or tall, sparse flower spikes. “We breed for a self-cleaning nature,” Heims said. “When the flowers fade, they retract, and newer flowers push through.” There is no seed production to inhibit flower production. A favorite with pollinators, ‘Cherry Pie’ loves full-sun, blooms all summer and can work as an accent for fall promotions. A tender perennial used as an annual, Plectranthus ‘Velvet Elvis’, is being lauded for its bushy form good for containers like P. ‘Mona Lavender’, but with double the number of flowers. “The floral display lasts for months, rather than being a flash in the pan like you get with other plants,” Heims said. Five years of breeding yielded a versatile plant that works inside during winter, where people can enjoy the black stems and aromatic foliage. It then can be introduced back outside in spring in part- to full-shade, where native hummingbirds enjoy the long tubular flowers growing to 32 inches in late summer to early fall. Coleus Terra Nova® ‘Electric Slide’. Coleus TERRA NOVA® ‘Electric Slide’ is remarkably self-branching, requiring no pinching. “Just put it in a pot, and stand back,” Heims said. Place it in the garden or landscape to witness a color combination that is stunning in both shady and sunny situations. “People don’t know these are quite sun tolerant and can be used in an industrial setting as a color blast,” he said. The canary yellow foliage contrasts with bright red veins framed by an emerald-green edge. Selected for its outstanding foliage, this 23-inch by 36-inch coleus nonetheless puts out a modest display of short violet-blue flowers late in the season. Coleus TERRA NOVA® ‘Macaw’ also requires no pinching of its glorious lobed leaves with maroon edges and cream centers. At 4 inches by 8 inches, this compact mound of brightness will light up a part-to-full-shade location outside and for inside container growing. The FlameThrower™ coleus series has a compact habit that won’t “eat” the container when mixed with other plants, according to Fossi. They sports delicate foliage and unique colors. FlameThrower Habanero is a deep rusty orange with an almost purple vein, and FlameThrower Spiced Curry is chartreuse and burgundy. They’re not as lush in full sunlight, she said, but they hold up, so they can be used in either sun or shade, and they don’t require pinching. “They finish off just fine,” Fossi said. “Bidens are one of those flowers that have been completely written off,” Fossi said. However, she thinks they deserve attention, especially the newer Bidens ferulifolia ‘Bee Bold’ and Bidens ferulifolia ‘Bee Alive’, which are compact, well-branched, self-cleaning and play well with others. Fossi likes them as groundcovers and in larger mixed containers or hanging baskets, where the bicolor red and yellow flowers and the pink and purple-striped flowers of Bidens ferulifolia ‘Pretty in Pink™’ bloom from early spring through summer. SuperCal® × Petchoa is a petunia and calibrachoa hybrid the size of a mini petunia (but not sticky like petunia) on a self-cleaning, nicely mounding plant with a spreading habit good for use as a groundcover and in containers. It comes in warm colors, some of which you don’t see in petunia, according to Fossi. With its smaller flower, it holds up to spring rain and is more heat and cold tolerant than its parents. Fossi went on to say that although it’s been out a few years, the reason to take a second look are the recent color releases, which include SuperCal Premium Cinnamon, with burnt orange and hints of yellow, and SuperCal Premium Sunray Pink, with a yellow throat and orange veining. Another profuse bloomer, with purple and red flowers, Cuphea purpurea ‘Firecracker’ is incredibly attractive to hummingbirds and excellent for filling in containers. It provides great texture and is also heat and drought tolerant. With its smaller flowers, it mixes well with other plants, especially dramatic foliage like coleus or black varnish plant. And Cuphea ‘FloriGlory® Diana’, is the 2018 AAS Ornamental Vegetative Winner, showing twice the number of flowers than others on the market and with drought tolerance as its other selling point, said Diane Blazek, executive director of All-America Selections and National Garden Bureau (Downer’s Grove, Illinois). Crystal Cady of Skagit Horticulture (Mt. Vernon, Washington) adds Salpiglossis sinuata ‘Royale Purple Bicolor’ to the list of outstanding flowers, saying customers are stopped in their tracks when they see it, especially because they have no idea what it is. With large blossoms sporting bright veins and contrasting colors, it is used more as a specimen, Cady said, and can easily be mixed into containers. As a bonus, it blooms for a long time, early summer to fall, and makes a good cut flower. Zinnia elegans ‘Queeny Lime Orange’. A 2018 AAS winner, Zinnia elegans ‘Queeny Lime Orange’ blooms with an unusual color variation of dark coral and orange, aging to a light peach with a red and lime green center. The softer, natural colors are perfect for weddings, Blazek said, as the 2- to 4-inch flower grows uniformly on upright stems of over a foot, and is long lasting in the garden and as a cut flower. Garden centers are getting better at giving customers reasons to keep coming back, said Leigh Geschwill of F & B Farms & Nursery (Woodburn, Oregon). That includes providing selections of plants both early in the season and later, but not of the same varieties. Although Peterson is no fan of its given name, he points to the spectacular colors of Ranunculus Sprinkles® Mix, which grow early and have fine leaves and improved, fuller and less leggy habit than previous cultivars. Peterson said the compact 8-inch by 10-inch plants are good in the shoulder season, tolerating cold greenhouses and available to garden centers by February, when they’re already budding up and ready to burst with showy blooms in brilliant colors such as orange, pink bicolor, red and violet bicolor. Also new and an early season offering, with snappy, bright colors and a sharply sweet scent, the Nemesia ‘Honey’ series shines in cold conditions, to 40 degrees, Peterson said, so growers can ship a 4-inch pot as early as the first week of March. The series comes in vivid yellows, purples and hues of pinks, with small blooms borne in clusters on a short 12-inch by 10-inch plant that puts on a good show, he said. For later in the season, Geschwill considers Mimulus x hybridus ‘Magic Blotch’ (mix) a showstopper, with bicolor appeal and a profusion of flowers with bright spots on flowers in flaming shades on tidy 10-inch to 12-inch plants. She has noticed when customers see it at the retail store, they want to take it home immediately. “It’s a fun, spotted flower with a low mounding habit that makes it suitable for edging a border or spilling out over the edge of a container,” Geschwill said. Similar to Mimulus, Lantana is a late-season purchase, and Bloomify™ Rose Lantana is worth the trip to garden center. Bloomify is unusual as one of the first sterile lantana series on the market, making for endless blooms. It is a solid performer, blooming all summer long — even through heat and dry spells — and will continue to reliably bloom up until first frost. “This great summer annual has a rounded, bicolor bloom like a verbena,” Geschwill said. “It grows slightly more mounded than spreading, does not require intense deadheading and is more mildew resistant.” Her trials show a tough plant that survives intense heat, with blooms that dry down to a berry-like shape that adds to its charm. Begonia T-REX™ ‘St. Nick’ brightens shady spots with its vibrant contrast of green, pink-red and spotted-white star-shaped foliage tightly and vigorously and generously displayed as if it had been sumptuously hand-arranged. In Heims’ experience, the original rex went through a dormant period, and this new series is a more consistent grower with improved genetics that “reinvigorated” the plant. “These have more crowns, are fuller, and for the grower, will fill out faster, with less time in the greenhouse,” Heims said. ‘St. Nick’ goes from plug to saleable plant in six weeks, has limited fertilizer needs and needs good drainage. Attractive pink flowers bloom in fall and winter, as an additional bonus. The Begonia T-REX™ ‘Stardust’ leaf shows a spiral in green, burgundy and violet, like an ocean wave, a surfer’s dream. With large leaves, and a bushy habit, this improved rex begonia has double the leaves. Gardeners just need to know that you can dry it out, and revive it when necessary with water only. Geschill believes most people don’t get super excited about begonias, but the newer varieties are “bomb proof” and beautiful. With so much impact and bred to be tough, garden-worthy plants that are bigger, fuller, taller and made to withstand sun and shade. “(They) are just hard to kill,” she said. There is no deadheading, they require little care and have masses of blooms, with plants that are full, tall and bigger than her zonal geraniums. “If you need to sell your home, these would have instant curb appeal,” Geschwill said. Cady of Skagit Gardens was first bowled over by Begonia ‘Canary Wings’ when she first saw it in the summer of 2016 in the backseat of friend and breeder Jared Hughes’s (Groovy Plants Ranch, Marengo, Ohio) car. 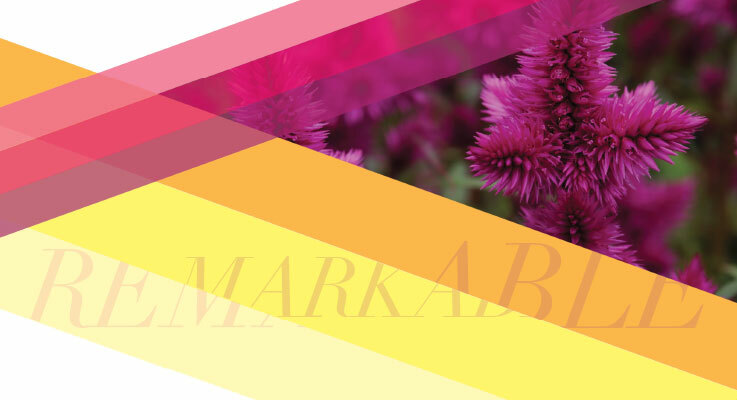 With its yellow-to-chartreuse leaves and abundant bright ruby and gold center flowers, she claims there is no other plant like it on the market. “I would use it more like a specimen, in a hanging basket, as a standalone that doesn’t need anything else,” Cady said. Gardeners need more options for shade, and this one performs all summer long. Browallia speciosa ‘Marine Bells’ is one of the few blue flowers for shade, according to Ellen Egan of Egan Gardens (Salem, Oregon). “Impatiens are every color but blue; fuchsia and begonia, too,” she said. Browallia is an upright, loose grower compared to impatiens and begonia, and you can fit it between perennials. When at 18 inches, use it as a taller addition mixed in with perennials. “There are so few shade perennials that have a mass of flowers, most are about the leaf, so it really takes annuals like Browallia to fill in the color,” she said. Talinum paniculatum ‘Limón Talinum’ has large chartreuse leaves with huge panicles covered in tiny hot pink flowers. Reaching a height of 28 to 32 inches, it works as a filler or accent mixed with other plants, is heat and drought tolerant and makes a fun cut flower, according to Cady. Eupatorium capillifolium ‘Elegant Feather’ has a lush, tropical look, with feathery foliage and unusual tiny flower clusters along the stems. Although it’s not known for its flowers, the flowers are fragrant and attractive to bees and butterflies. Cady suggests that this selected, sterile form of the plant can be used as a specimen, in borders and backgrounds. With Sunflower Suntastic Yellow with Black Center F1, an AAS winner, breeders have finally figured out how to get sunflowers to not be a “one and done” type of plant, according to Geschwill. This new breeding allows the sunflower to have multiple waves of blooms for an extended season of about 6 to 8 weeks. Of course, sunflowers are excellent for pollinators, as it hangs on, providing more forage in the yard. “Outlandish little flowers” is how Geschwill describes New Day® Strawberry Shortcake Mix Gazania, with its cheerful, bold and large blooms with stripes and deep eyes. The sturdy, shiny leaves are thick — “think polished leather,” she said, “but with a succulent-type quality” — and the flowers close at night, open during the day and require no deadheading. Once planted, they have low water needs. It’s not one of the first plants Geschwill’s customers look for, but is great for beginners and especially in dry conditions. Egan is also a fan of Gazania because of its big daisy face with bright colors and low growing, mounding habit that can be put everywhere, in beds, rock gardens and containers. Kiss™ Flame Mix and Kiss Orange Flame are long blooming, showy, heat and drought tolerant, and bees and butterflies love them. When Blazek tried to kill Vinca Mega Bloom, she said it just wouldn’t die. She dried it out, drowned it, transplanted it as tiny weak sprouts — but they just wouldn’t succumb. Bred in a rainforest climate for heat and humidity, the two flowers in the AAS winning series are Orchid Halo F1 and Pink Halo F1. They are vigorous growers, resistant to powdery mildew and sport 3-inch blooms with a wide white center and rich colors on a compact 13-inch to 15-inch plant that makes a good substitute for impatiens in sunny locations. If you can get past the name and the reputation of ornamental peppers, then you will fall in love with the pastel-colored edible peppers of the compact, 8-inch by 10-inch NuMex Easter, Blazek said. The name is for the colors, not for the growing season, of light purple, orange and yellow on this AAS winner. For so many reasons, Egan said the underrated and rarely seen Melampodium paludosum ‘Showstar’ is a workhorse that landscapers should be using instead of marigolds. It has a reliable profusion of big and bright golden flowers like marigold, but is not a slug magnet, and lasts through fall. It works in smaller groups and is effective in large swaths. “It has slightly wider growth habit than marigolds, with brilliant color and ease of care. It definitely should be used in the landscape,” Egan said. For night strollers, the perfume of Petunia Evening Scentsation F1, an AAS winner, gets headier as the evening rolls around. The soft blue purple multiflora has a spreading habit of 5-8 inches with a variety of shades on one plant. “Some are a little bit deeper purple than others,” Blazek said. “If you’re going to plant a container, it gives it interest,” to be slightly less uniform in color while still embracing a uniform height and bloom time. Tracy Ilene Miller is a freelance writer and editor who covers several topics, including gardening. She can be reached at tracyilenemiller@gmail.com.